It’s Congenital Heart Defect Awareness Week. And seeing as how I was born with one, I thought I’d share my story for the sake of awareness. 😉 Thanks to my mom for helping me get the facts straight. It started when I was 6 months old. I got double pneumonia and one of my lungs collapsed, so I had to be hospitalized. About a year later, I got pneumonia again. During that time, my family had temporarily relocated to Endicott, New York, for my dad’s job with IBM. During my post-recovery checkup, my doctor there noticed that my heart didn’t sound right, so he recommended that my mom get me checked out after we returned to Rochester, Minnesota. Almost immediately after returning to Rochester, when I was about 2, my parents took me in for an EKG. 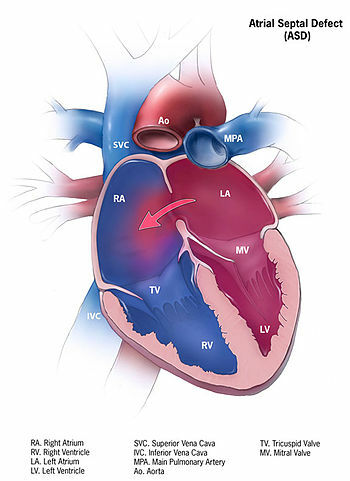 They discovered that I had an atrial septal defect. As my parents explained it to me growing up, I had a hole in my heart, so the blood flowed where it shouldn’t. My lungs were ‘squishy’ with extra fluid, which is why I kept getting pnuemonia. There was a chance, though, that the hole would close itself. So my parents waited to see if it would. But by the time I turned 4, it still hadn’t so they decided to move forward with the surgery. Open heart surgery. The year was 1987. AIDS was getting a lot of attention (and fear) in America. The doctors told my parents that they couldn’t guarantee that the blood transfusions they’d give me during surgery would be HIV free. My parents were not having that, so they both got tested and my mom’s blood was the closer match. The doctors thought they could probably find a closer match from the blood bank, but my mom’s was close enough. Now the only problem was that the blood bank wasn’t set up for someone to donate for another specific person. You could donate blood for yourself, or for other people in general, but it took a lot of negotiating with the blood bank and surgeon to convince them to let my mom donate blood for me. Finally, they allowed it, and over the course of a couple months, my mom donated 5 units of blood. The day of surgery arrived. Since I was so young, I don’t remember a ton. I remember playing in a play room with other young patients before my surgery. And I remember waking up with a breathing tube down my throat. That’s about it. I arrived at the hospital the night before and my mom stayed with me. She was most worried about me having to get a breathing tube put in. I was brave though, and waved as I was wheeled into surgery, not on a bed but in a little red wagon. The doctors had planned to cut me open straight up and down, but my mom requested that they not. So instead, they cut me horizontally from the middle of my chest across to under my right arm. I have a scar there, and 2 more on my stomach – one on the side, one on the upper front – from tubes. During surgery, the doctors stopped my heart to close the hole. That’s amazing to me. I was in the hospital for 5 days. I recovered very quickly, and was up and running around in no time. I didn’t complain much about the stitches. My mom actually had a congenital heart disorder too. Hers was a Patent Ductus Arteriosus. She had surgery when she was 5 in the year 1958. It was the first kind of heart surgery doctors were able to perform successfully. She stayed in the hospital for 10 days. Approximately 9 in 1,000 babies are born with a congenital heart defect. At Emma’s last doctor appointment, they observed that she has an innocent heart murmur. They said it’s nothing to be concerned about, and most kids outgrow theirs, but it’s definitely something I’m going to keep an eye on, given my history. I can’t imagine going through with Emma what my parents went through with me!